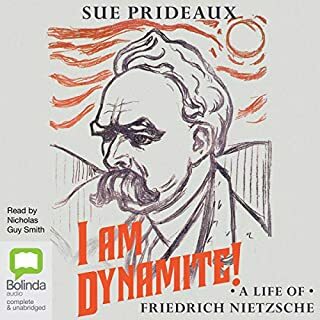 Strips back the accoutrements of triumphalism and myth built up over Nietzsche’s troubled reception history to provide a wonderful, evocative and honest portrait of a hyper-talented, sensitive soul way ahead of his time. Pleasing dramatic reading by Nicholas Guy-Smith. The pendant in me found the ostentatious over-pronunciation of German names, words and proper nouns to grate after a while. Far too portentous and overwrought. Not sure why he felt the need to pronounce the work “Nachlass” (referring to Nietzsche’s unpublished manuscripts and letters, etc) with a hint of Darth Vader each time.